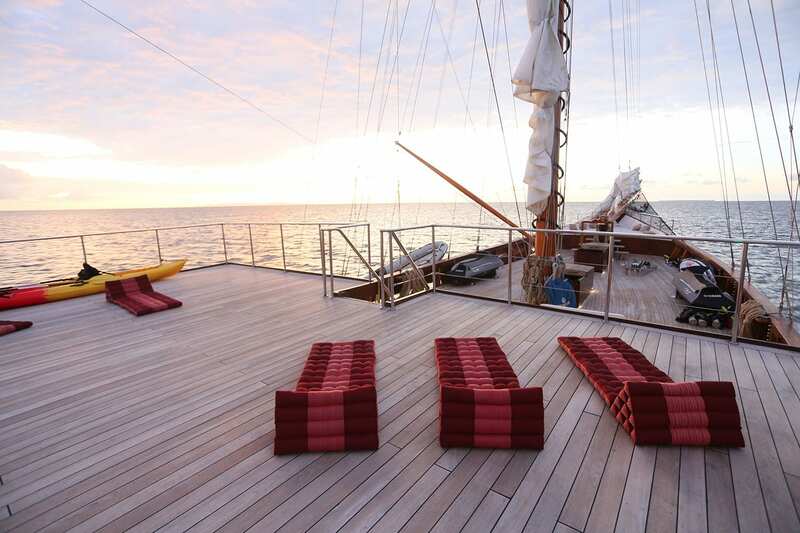 Measuring in at 65 metres, Lamima is the world’s largest wooden sailing yacht and one of the most luxurious Indonesian Phinisi ships ever built. 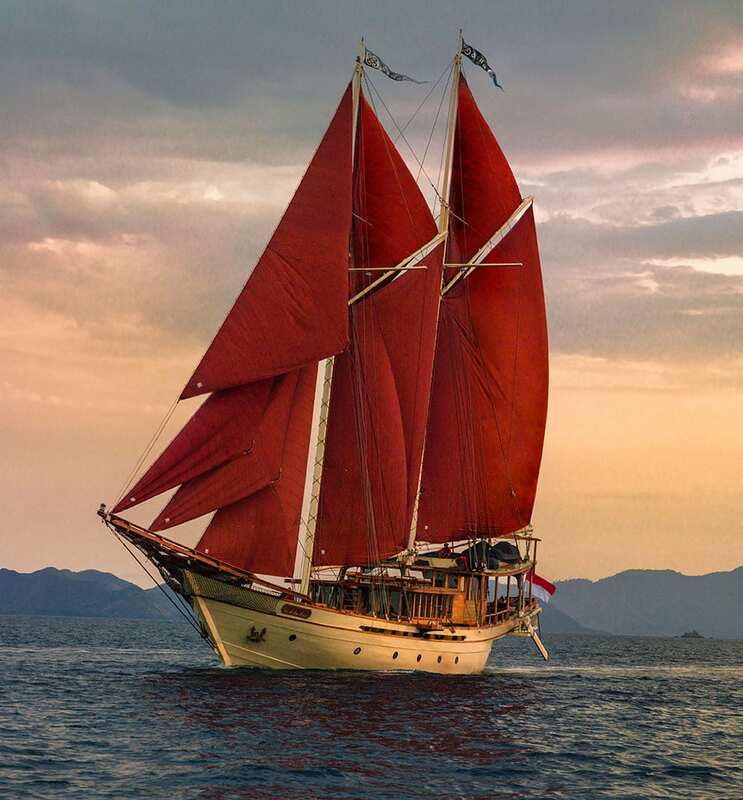 Built in Sulawesi by shipbuilders whose craft has been passed down through the generations, this two-masted yacht features traditional Phinisi lines and elements along with the latest concepts in modern yacht design and technology. In fact, every detail about Lamima was meticulously thought out to provide guests with the ultimate luxury, comfort and five-star facilities, safety and service. From the expansive teak wooden decks and billowing sails to the understated elegance of the cabins and lounges, the portholes that allow in natural light in during the day and the soft ambient lighting throughout the ship after dark, Lamima is like a floating five-star villa with inviting spaces that seamlessly blend indoor and outdoor living. 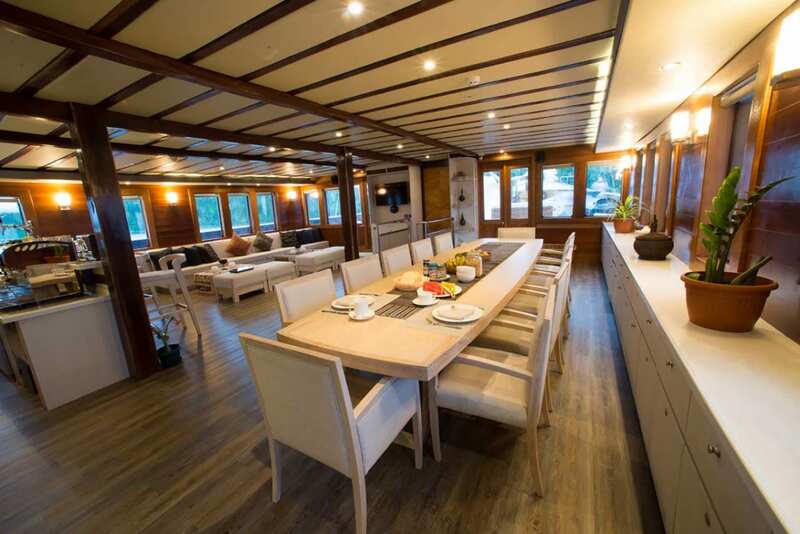 On the main deck you have a saloon with a bar and a dining table that can seat up to 14 people, an al fresco dining area and lounge shaded by a fabric bimini, and a relaxation area at the stern where you can indulge in massages and beauty treatments. 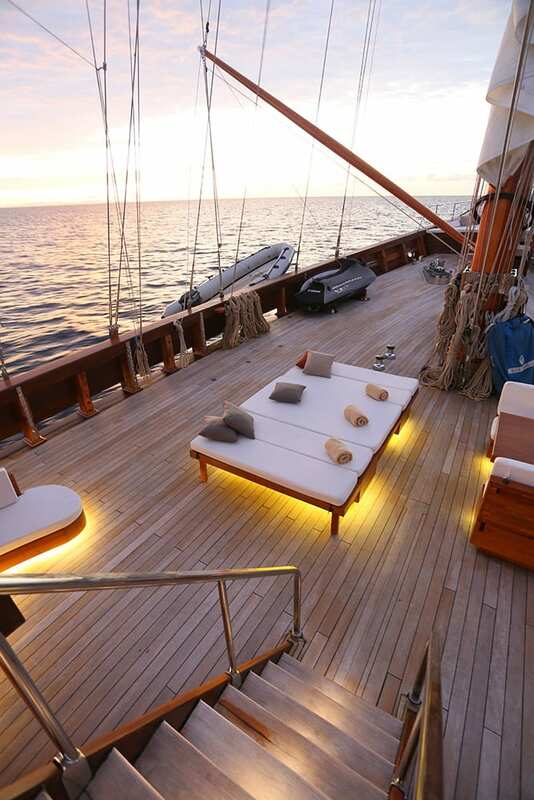 There is also an intimate nook by the bowsprit, and an upper deck where there are sun loungers and panoramic sea views all around. During the summer months, Lamima cruises to awe-inspiring destinations in the Indonesian archipelago including Flores with its pink sand beaches and three-coloured volcanic lakes, Komodo National Park, the only place on Earth where Komodo dragons reside, and the stunning Raja Ampat region with thousands of uninhabited islands and amazing underwater sights like caves, cliffs and vibrant coral reefs teeming with marine life. The rest of the year Lamima heads north to the jewel-like islands of Thailand and the Mergui archipelago off the coast of Myanmar. 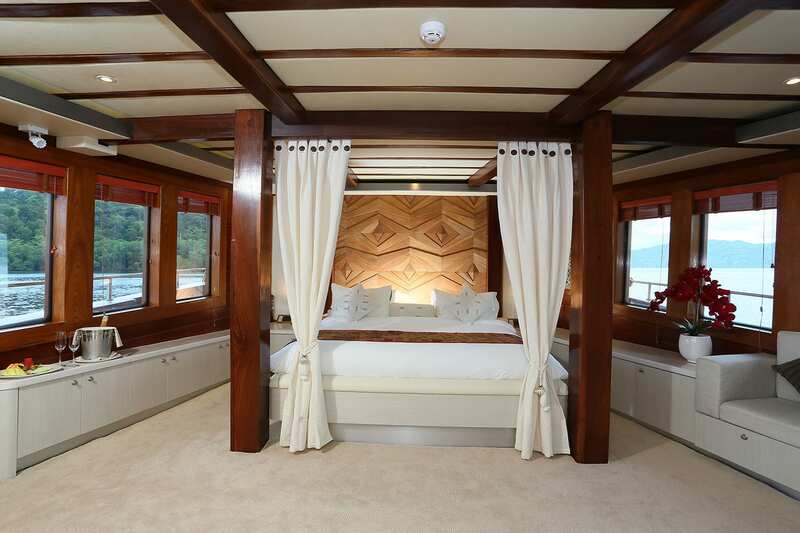 Lamima can comfortably sleep up to 14 people in 7 luxurious cabins that feature modern design elements and touches of Indonesian tradition. 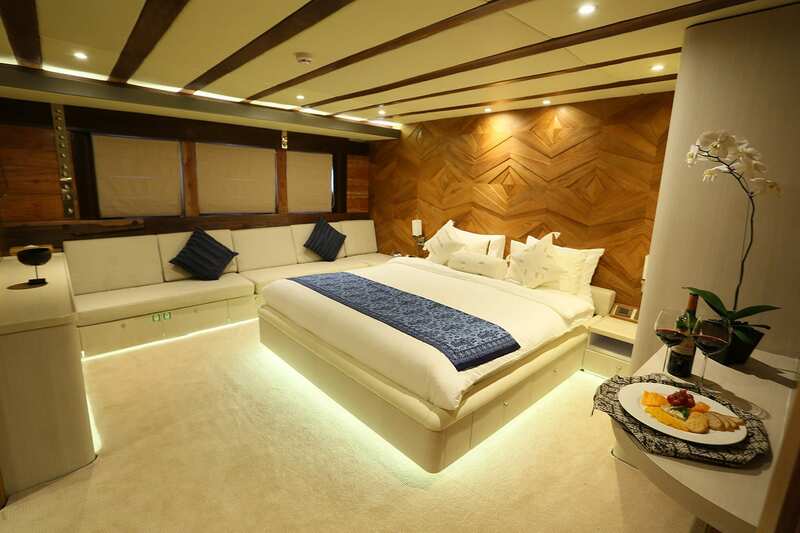 You have your choice of the massive master cabin that measures 60 square metres and sits above deck offering spectacular views of the tropical landscapes passing by or six lower deck cabins including four double and two twin cabins with plenty of windows. Each cabin has its own ensuite bathroom, air-conditioning, Internet, HD TV and an iPod docking station, as well as plenty of storage space. 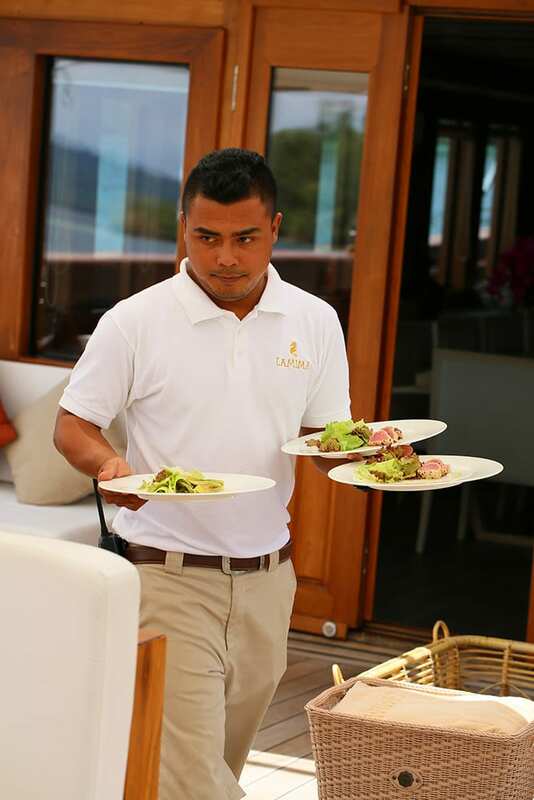 The 19 crew members aboard Lamima have years of experience working on yachts, cruise ships and in the hotel, spa and hospitality industries, so you can be sure that your every need will be met with warmth and professionalism. 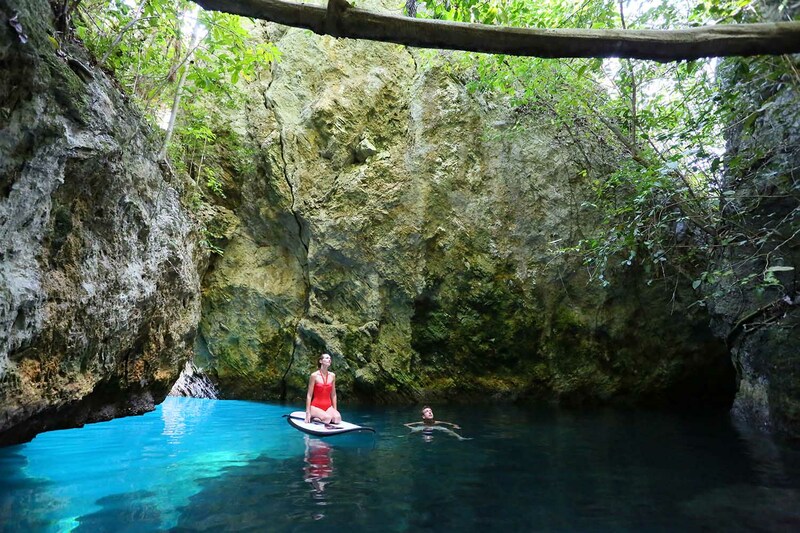 While onboard Lamima, you can indulge in gourmet meals and massages, get out and play in the water with the snorkelling gear, water skis, kayaks and stand-up paddle boards, get your PADI certification with the ship’s dive guide, or arrange excursions to deserted beaches, jungle-clad islands and local villages. Lamima was built in 2013 and spans 65m with a beam of 11.2m and a draft of 3.6m. 7 cabins accommodate up to 14 guests. She has a maximum cruising speed of 10 knots. Samata is a luxury yacht that combines traditional Phinisi design with modern European touches & state-of-the-art amenities. 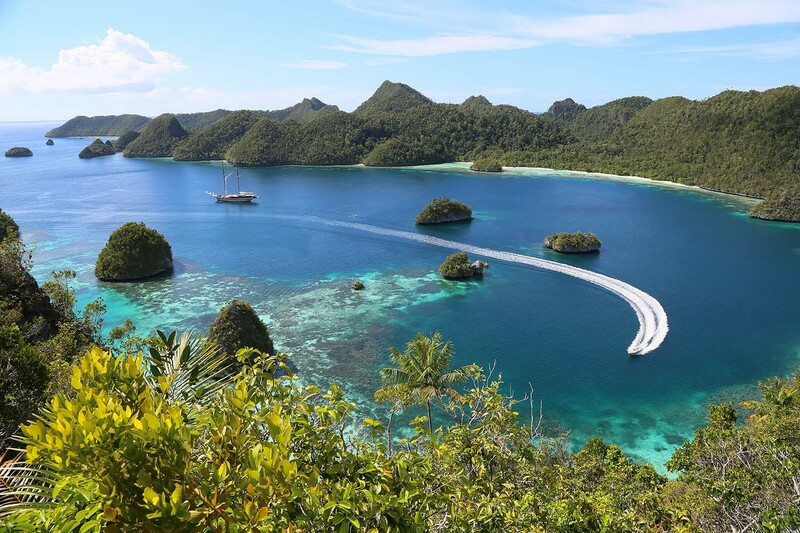 With 3 decks, spacious interiors & 5 luxurious cabins, explore the pristine islands of Indonesia in unforgettable luxury. 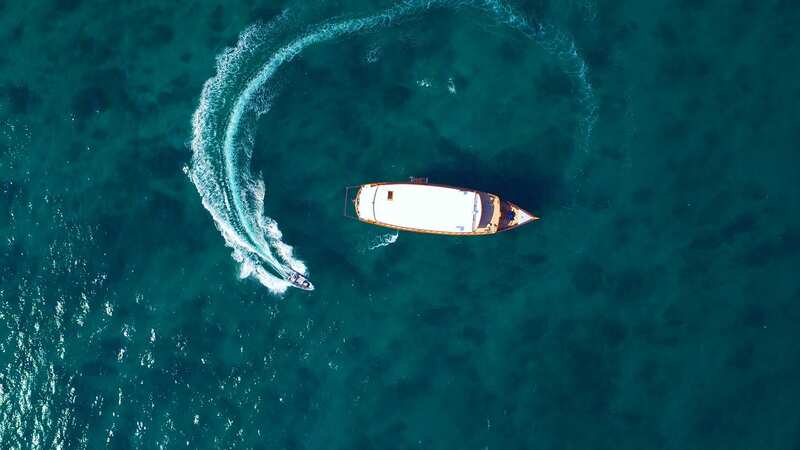 Ocean Pure is a recently refitted phinisi yacht that launched in 2017. 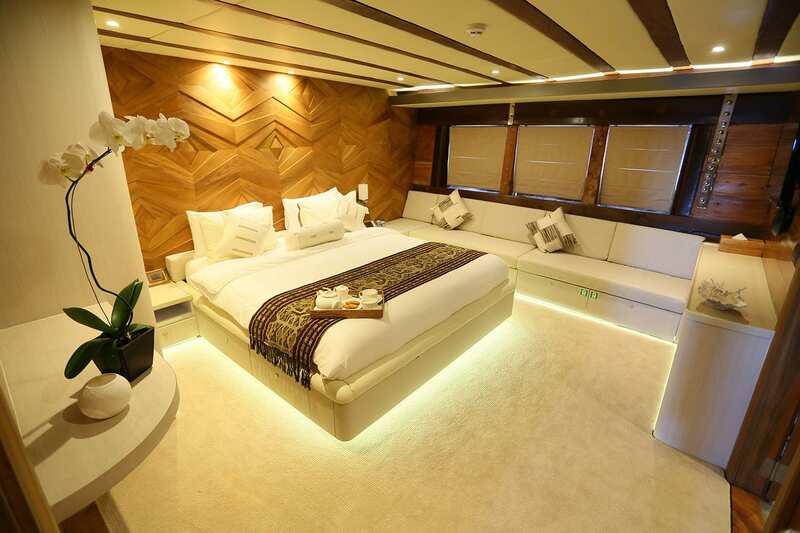 The owner is a renowned designer and hotelier who has spared no effort ensuring that every inch of this 40-metre beauty exudes class, comfort & cutting edge technology. 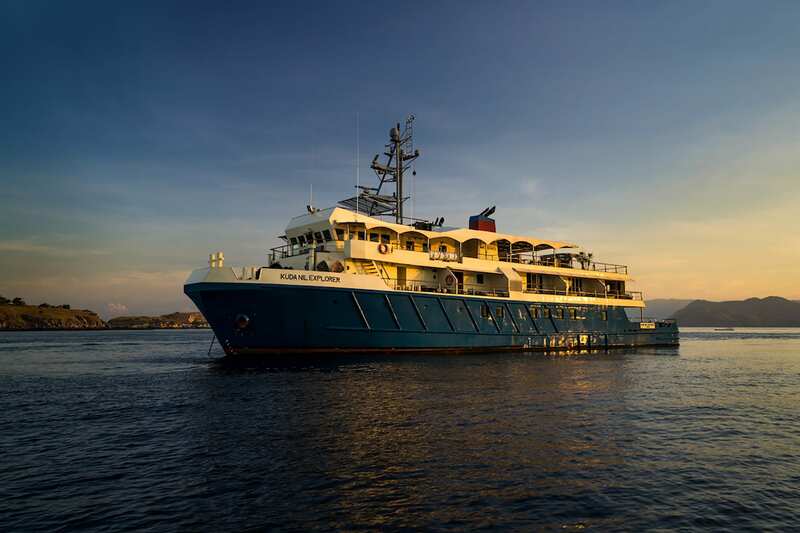 Kudanil Explorer is a beautiful luxury expedition yacht with 8 stately cabins and plenty of outdoor and indoor areas. 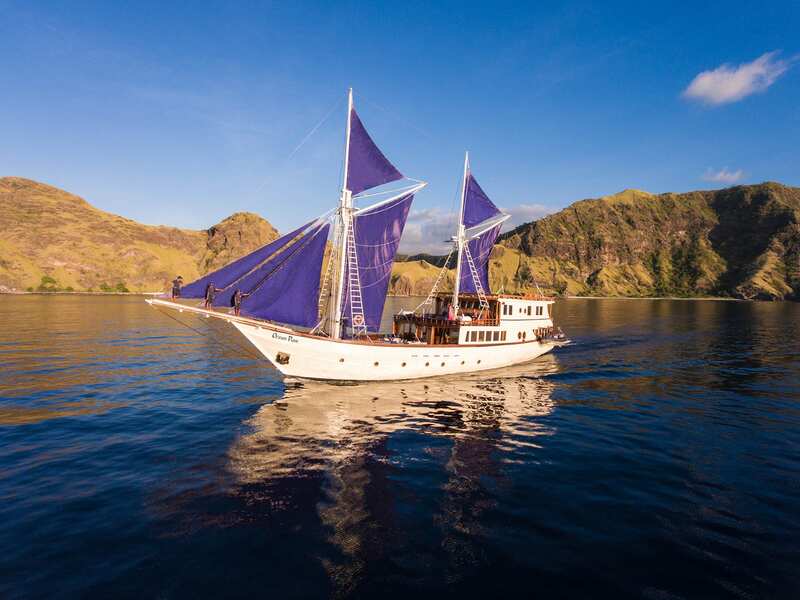 This is the perfect cruising ship for groups wanting to explore remote corners of the Indonesian archipelago in style. 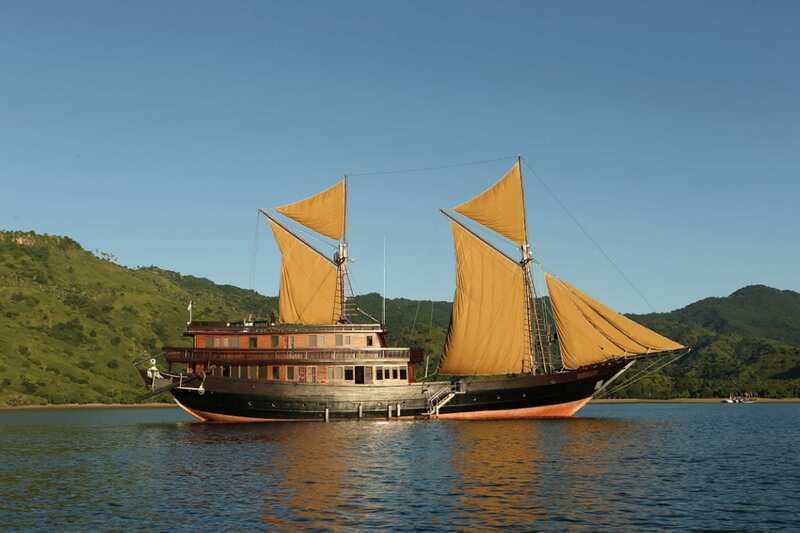 Alila Purnama is one of the most luxurious liveaboard phinisi yachts in Indonesia. 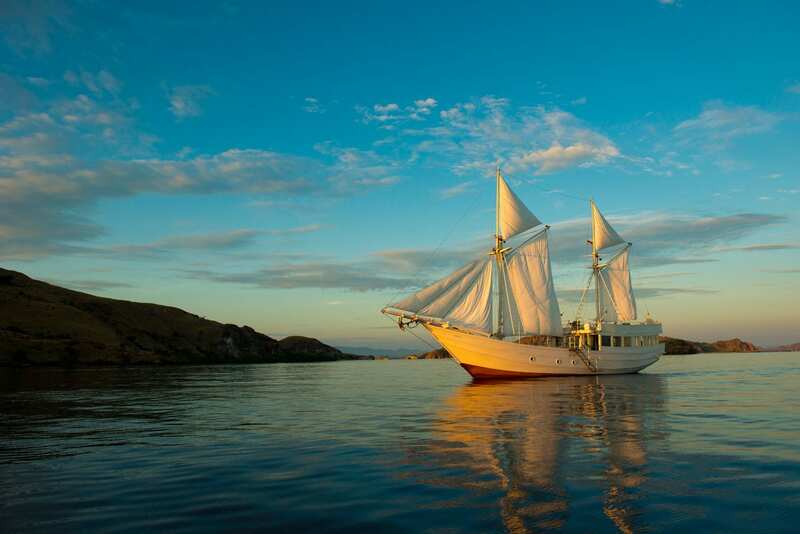 Providing expansive spaces, 5-star amenities and services; she cruises throughout Indonesia with a focus on Komodo National Park & Raja Ampat. Si Datu Bua evokes the spirit of the golden age of exploration with her traditional Phinisi design, yet she also boasts the cutting edge technology and superior service of a modern day superyacht. This is the sister ship of the much sought after Silolona. The luxurious and exquisite Silolona boasts spacious decks & cabins, elegant furnishings & decor, and a dedicated crew who offer exceptional service & experiences as you journey to some of the most beautiful and beguiling islands on Earth. 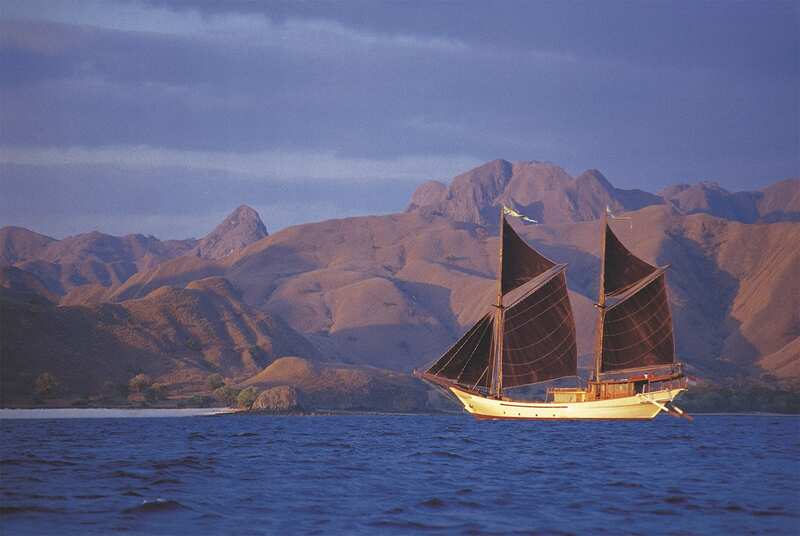 Staying true to her Indonesian name, Dunia Baru takes guests to a “New World” saturated in luxury and adventure. Combining traditional phinisi design with all the high-spec amenities you might expect to find on a modern superyacht. Rascal is a luxury superyacht that draws inspiration from Hampton’s style beach houses. 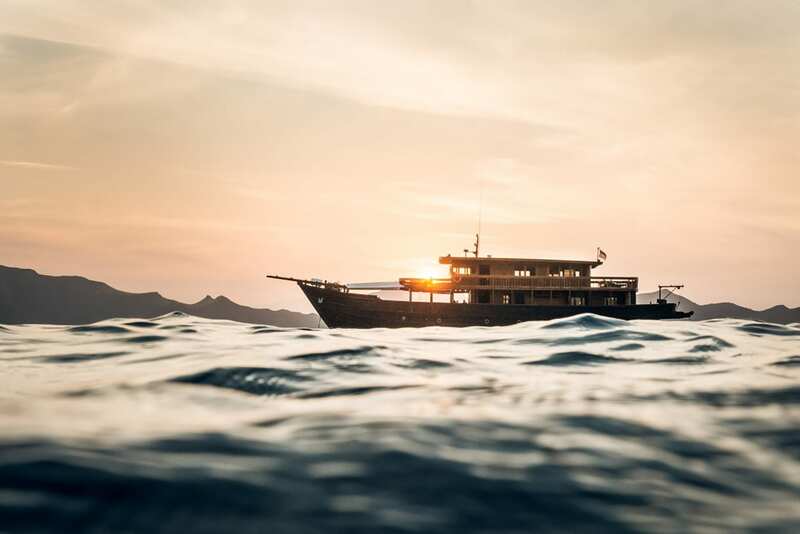 Rascal voyages include bespoke journeys to Komodo National Park, Flores and Raja Ampat for an off-the-grid luxurious adventure. 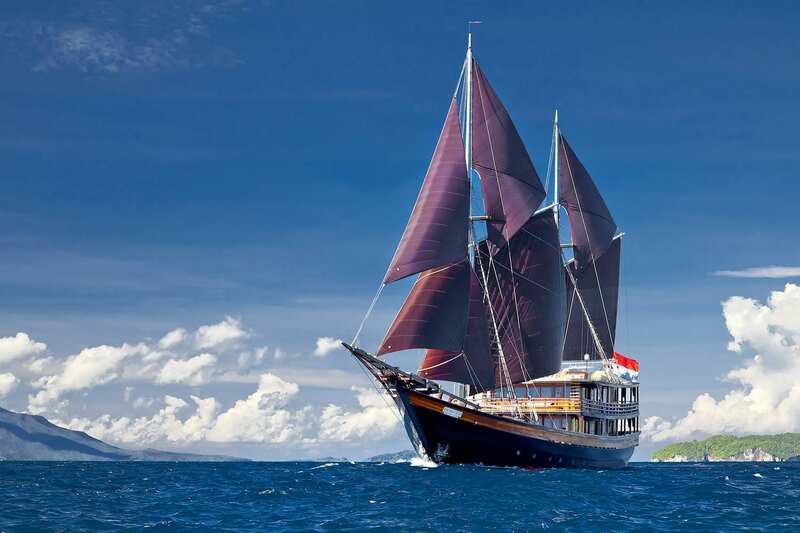 For a 5 star Indonesia cruise, Amandira Voyages are hard to beat. 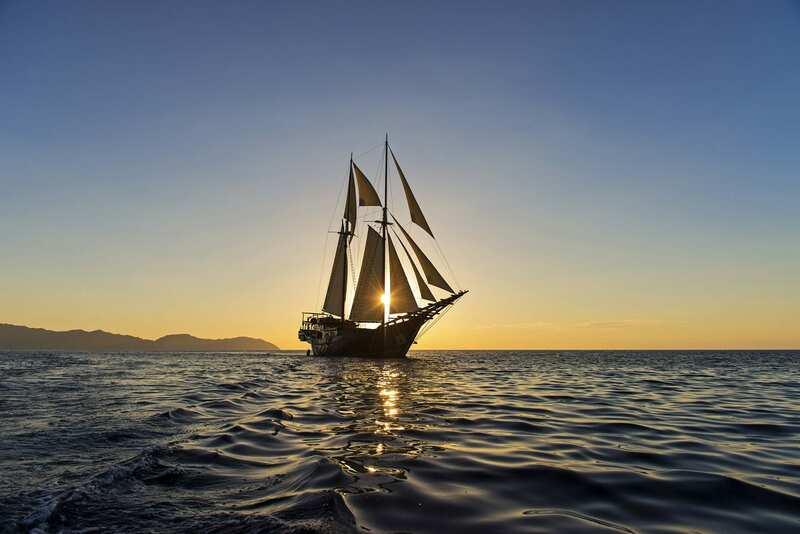 This luxury 52-metre, two-masted Phinisi yacht handcrafted by shipbuilders of the Indonesian Konjo tribe offers tailored voyages to Raja Ampat & Komodo Island in Indonesia. Lovers of luxury may be familiar with Aman Resorts and their legendary five-star locations around the world. 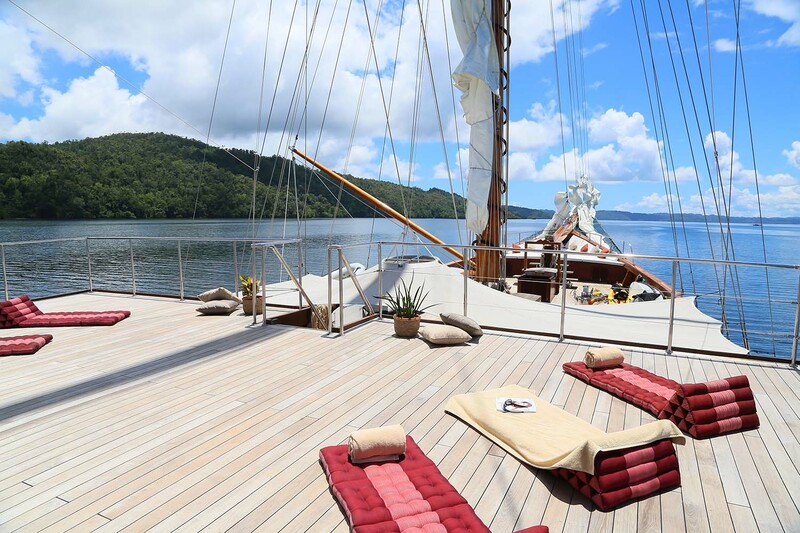 Amanikan is their first luxury cruiser and offers all the comfort and service of a world-class Aman Resort. 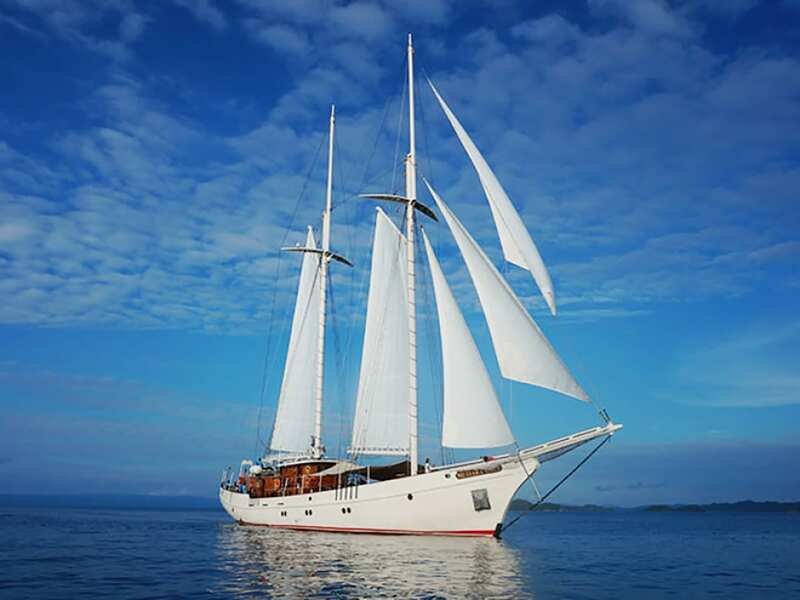 This exotic charter yacht Mutiara Laut offers luxury private charters to the most remote islands of Indonesia. 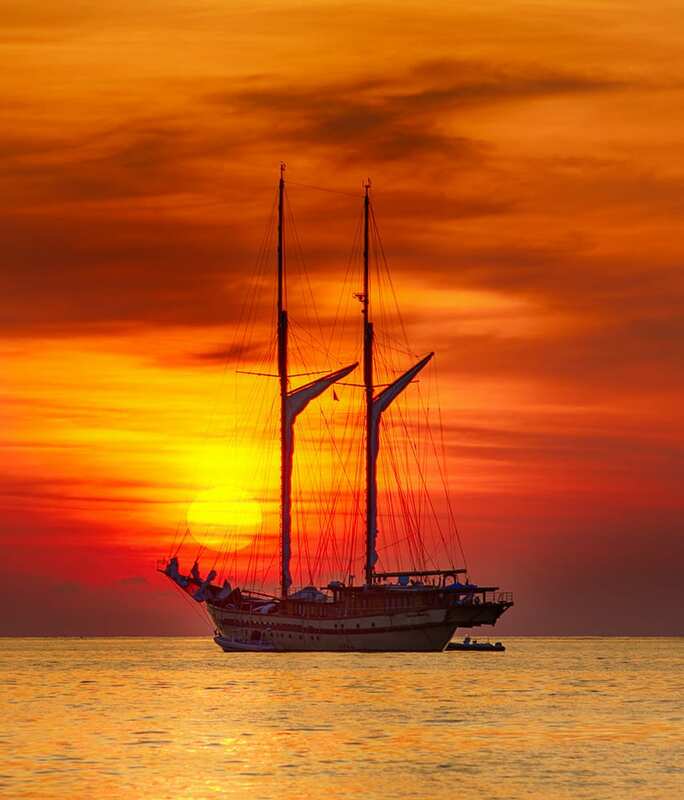 Cruise itineraries are individually tailored to guests and she can sail and reposition to any place that you desire. Mischief is a luxury yacht that combines traditional Indonesian phinisi boat design with contemporary beach cottage interiors. Both spacious and elegant, Mischief is ideal for those looking to sail around the Indonesian archipelago in modern luxury. 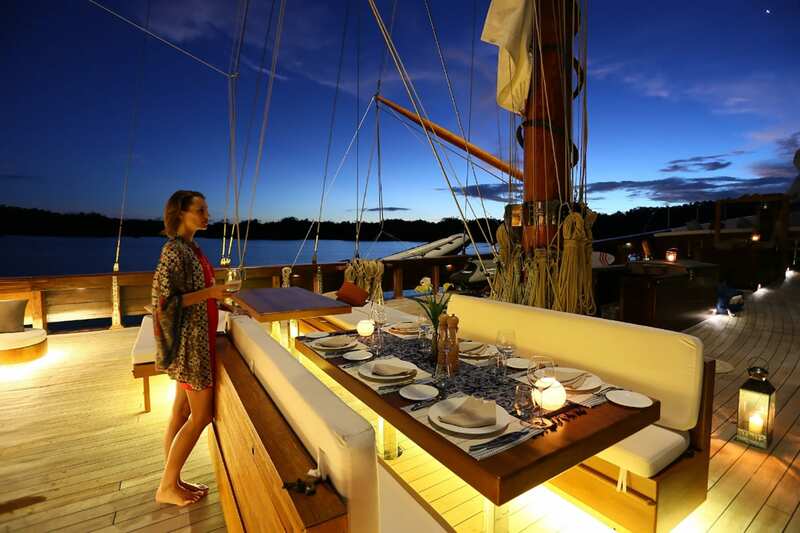 Alexa is undoubtedly the most romantic luxury sailing yacht in Indonesia. What is essentially a floating resort for two, Alexa is the obvious choice for a romantic escape or incredible honeymoon to explore the wonders of the Indonesia Archipelago.